Munich saw the introduction of our Hallowed and Illustrious Computer Overlords. All hail. Oh, and his name is Dave. Hi, Dave! I’ll admit to a moment of inappropriate laughter (yes, that was me) when the name was announced. I honestly thought we, the assembled media, were being punked. I mean, it was as if someone were channeling something out of Hitchhiker’s Guide, and I started looking for my towel. The overt reference to A Space Odyssey, the monocular window into Dave’s computerized, four-part FPGA-based soul, and I was sure something space-ish was about to happen at the Chord Electronics release announcement/party. Like Zaphod Beeblebrox popping out of a cake. Or someone playing “Daisy” over the loudspeakers. Something. But nope. [Sigh] … the humiliation continues. Digital Audio Veritas in Extremis (aka, DAVE) will replace the outgoing models DAC64 and QBD76, and follow in the footsteps of the Hugo, Hugo TT and 2Qute by offering the latest thinking along the line of that field-programmable gate array decoding stuff that’s been very popular over at PS Audio and Playback Designs, and, yes, Chord Electronics. Support for file resolutions up to and including 768kHz PCM and Quad DSD will be supported over USB. Price is going to be £7995. 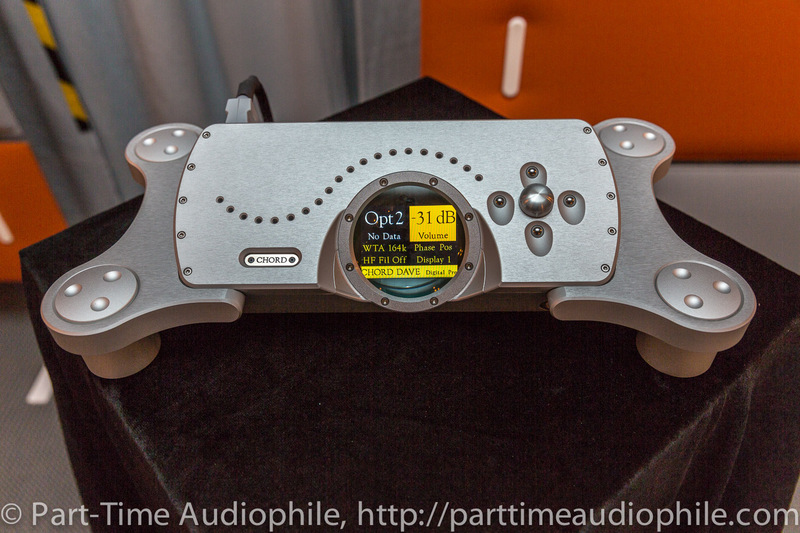 DAVE is a highly advanced reference-grade DAC, digital preamp and headphone amplifier. Hand-made in Kent, DAVE is based around a proprietary FPGA (Field Programmable Gate Array) offering more than ten times the program capacity of its predecessor. At its heart lies a new (and in electronics terms, huge) LX75 version of the Spartan 6 Field Programmable Gate Array (FPGA). The FPGA’s extraordinary capability enables a number of key sonic benefits including significantly improved timing and the best noise-shaper performance of any known DAC. DAVE’s technology delivers music with unmatched reality and musicality, with an unrivalled timing response.